Hey there! How's summertime treatin' you? But, that's always how summer is, time flies when you're having fun. This summer I really wanted to add some color into our family room. We are about to celebrate 4 years in our home and I've pretty much stuck with my black and beige with some spring/summer apple green accent color thrown in for good measure. I am so over it. I mean really, just over it. Done. I was so over it that I sold all of my pillows... and I'll never look back. Even if the cheap lady at the garage sale offered me $2 for 4 throw pillows that I only had marked for a dollar each. Really lady? Those are $20 pillows each and they're in decent condition and you want to pay .50 cents?! Go away. So anywhooo, back to my mantel. 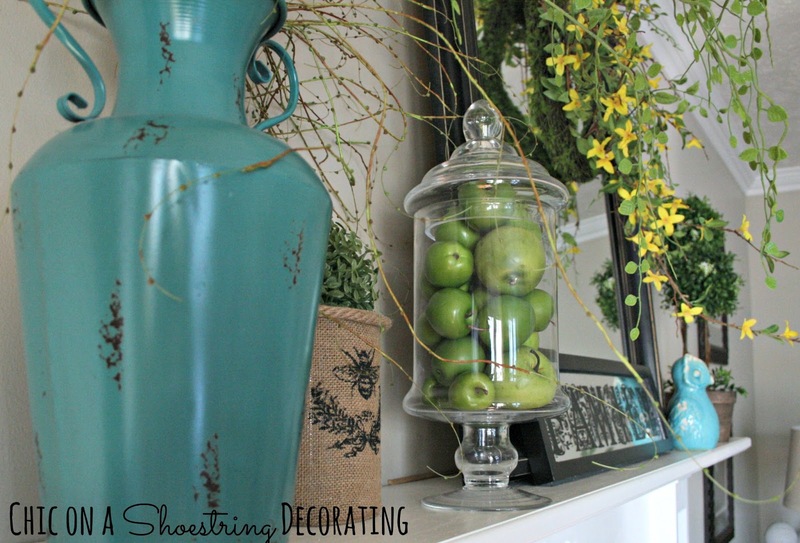 I pulled in some turquoise (my new obsession), yellow and a little green apple green (because I still like it) to add some new splashes of color to my family room. I recycled a lot of items that I already had so even though I gave my mantel a whole new look I didn't spend much money. As you can probably see, I recycled a lot of the same items but moved them around and added a few new colorful pieces to really change the look. I think it made a big difference even though I reused so much of it. 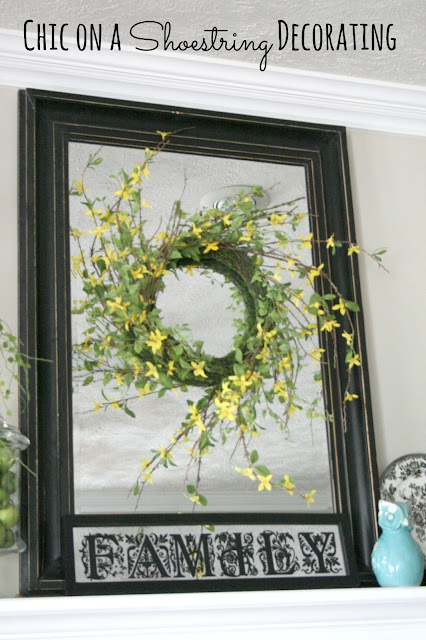 I added this new forsythia wreath that I picked up 90% off at the end of last Spring, it cost me a whopping $3 bucks. I like it better than my old one because it is very three-dimensional, lots of pieces sticking out of it which adds some great texture. 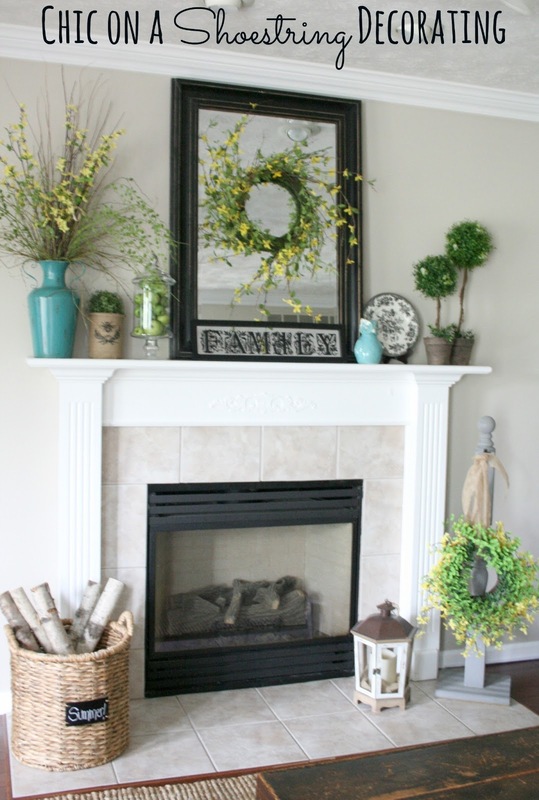 One of the tricks of making a great mantel is layering. From this side view of my mantel you can see that nothing is lined up, things are either pulled forward or pushed back with something slightly behind it or in front of it. Another good trick for mantels is varying sizes of pieces and adding texture. All of the items vary in size and this pic also really shows how three-dimensional the mantel is... lots of branches and floral stems sticking out all over the place which adds a lot of texture. Don't forget to dress up the hearth (bottom) of your fireplace too. Mine is really simple with a basket of birch logs that I also used for my Christmas mantel. I've got a lantern you see on the floor and a lantern post holder that I hung my old Spring wreath on. No need to go crazy on the hearth, don't want to risk looking cluttered but don't want it to be bare nekked either. 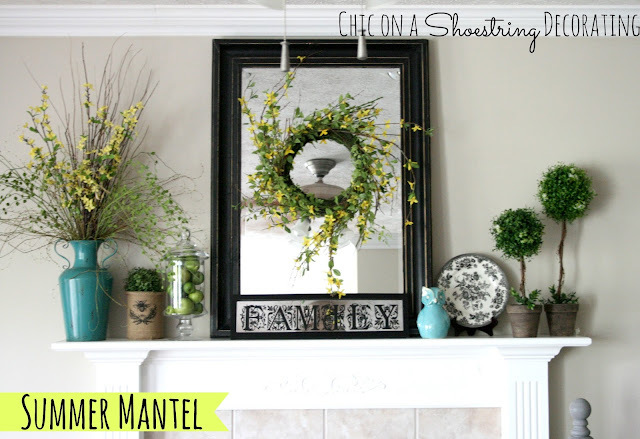 If you enjoyed my Summer mantel I'd love for you to check out some of my other favorite mantels I've done over the past few years... you can find them here: Halloween, Christmas, Easter and see how I changed this fireplace from dated oak and brass to the modern white and black you see above. Stay tuned for a post with the rest of the room decked out in these pretty summer colors! Hi Kate! Your mantle looks great! (or is it mantel? I never know how to spell it..ha!) I think I have the same burlap/bee candle holder thingy. :) I love your forsythia wreath. Such a fun pop of color. That turquoise owl is too cute! I'm off to check out your other mantles now. :) Have a great week! Love th pop of turquoise and the forsythia added to the mirror. Looks great! Very pretty! 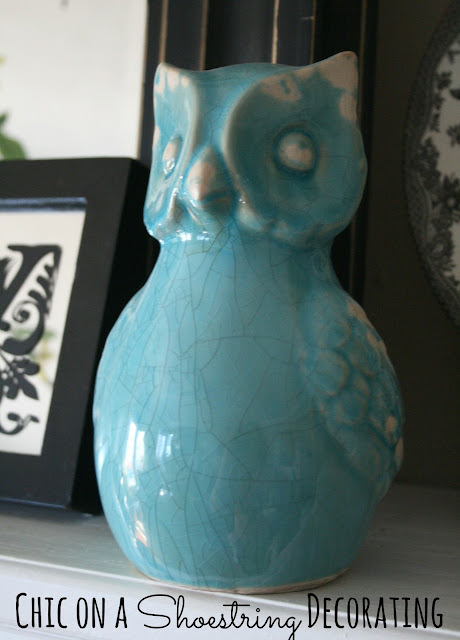 I love the splashes of turquoise and that owl is just too cute! This really only needs one word--beautiful! Hello Kate. Your Summer mantle is so cool and refreshing. Love the blue, green and yellow all together.